272 pp., 6" x 9"
This book demonstrates how a participatory approach to assessment and accreditation in their new forms creates a synergy for learner-centered education. 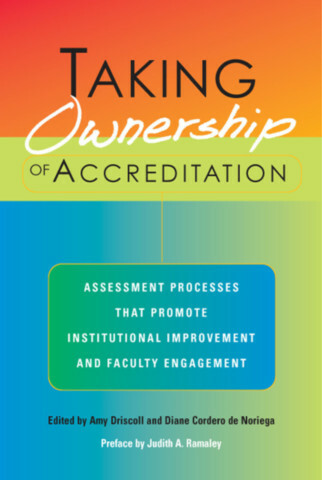 It is a guide to approaching the accreditation process from a campus-wide perspective of ownership--illustrated by rich descriptions of how faculty, students, and administrators at California State University Monterey Bay engaged with and successfully focused their accreditation processes on the improvement of their practices. The approach that the authors describe was driven by a commitment to go beyond satisfying the accreditation expectations so as to promote ongoing and long-term improvement of student learning. It also reflects the shift of responsibility for assessment within institutions from a designated office to individual faculty and staff, entire departments, and the campus as a whole. The authors document strategies that are practical—ready to use or adapt—that are appropriate for all campuses. They also provide guidelines for the documentation process that accreditation demands. They demonstrate how they reduced traditional resistance to assessment by emphasizing its use for the improvement of student learning, helping faculty with their own teaching, and creating frameworks for continuing improvements that are valued by faculty. The authors emphasize the need for every institution to take into account its unique mission, vision, and core values; and to recognize the importance of individual departmental cultures. Although their accreditation "triggered" CSUMB’s engagement with assessment, the authors discuss other opportunities for jump-starting the process. Moving On To Other Pastures? Using Direct and Quantitative Methods to Triangulate Indirect Qualitative Methods. “This revealing account describes how CSUMB worked on the inside to develop an exceptional learning organization that set a new approach to accreditation. It shows how internal commitment can be joined with external accreditation requirements to engage faculty in scholarly inquiry about student and faculty learning, leading to a number of innovative activities that serve the University long after the accrediting team leaves. This book is useful whether you have an accrediting visit coming soon or not."